Exocytosis is defined as the transport and fusion of secretory vesicles with the plasma membrane and the extracellular space. There are three exocytosis pathways that deliver vesicles to the plasma membrane. Found in all cells, the constitutive secretory pathway operates continuously to deliver freshly synthesized membrane lipids and proteins, and soluble secretory proteins from the Golgi network directly to the plasma membrane. The regulated secretory pathway is found in specialized cells whose role it is to secrete specific cargo, such as hormones, neurotransmitters or enzymes. In these cells, secretory vesicles accumulate and concentrate their cargo through a process of retrograde movement through the Golgi. Once the vesicles are loaded to the correct concentration, they are transported via cytoskeleton tracks near the site of secretion (e.g. the synapse in neurons) to await the signal to fuse and release their contents. 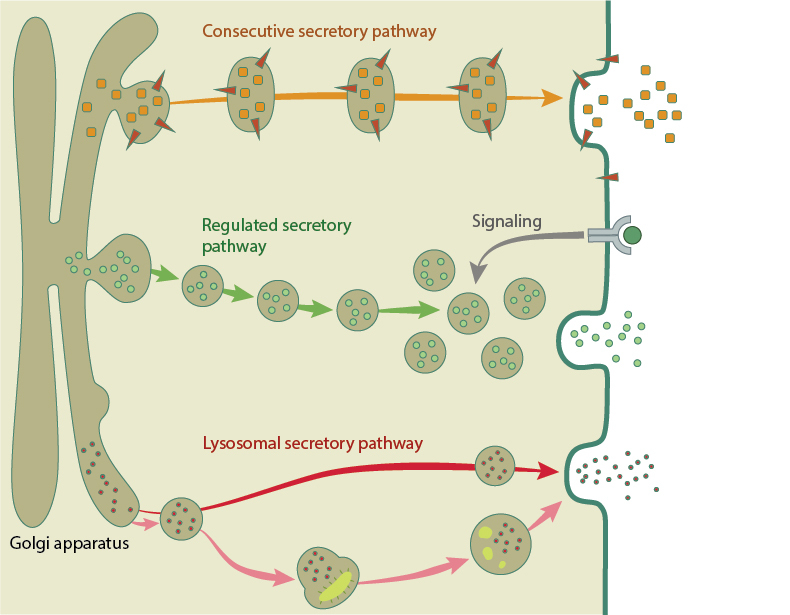 The third sorting pathway involves fusion of lysosomes with the plasma membrane. This lysosomal exocytosis can deliver extra membrane for repair, eject undigested debris out of the cell, and secrete cargo such as pigment , . Examples of the three exocytosis pathways. The constitutive secretory pathway (orange arrow) directly delivers fresh membrane lipids and proteins to the cell membrane. The regulated pathway (green arrows) is used for specific cargo like hormones and neurotransmitters. Secretory vesicles traffic and accumulate at the membrane, where they await a signal for release. The lysosomal pathway directly transport cargo to the membrane (red arrow), or digest and eject debris out of the cell (pink arrows). In the majority of cells, vesicles are transported along microtubule tracks using kinesin or dynein motors towards the microtubule plus or minus end, respectively , . However, vesicles can also be trafficked along the actin cytoskeleton using myosin II and myosin V motors , . Crosstalk between the actin and microtubule networks also influences secretory vesicle movement, with recent work showing that RhoA, and its downstream effector, the actin nucleator formin mDia1 as a key regulator for vesicle mobility along microtubule tracks . In order to avoid multiple full-collapse exocytosis events disrupting the size or shape of the cell, endocytosis rapidly removes and recycles the vesicle components from the membrane. However, this recycling and delivery of membrane by exocytosis can be used by the cell to enlarge the membrane and surface area during cell shape changes. This is particularly relevant to cells undergoing mechanical stress, which occurs during processes such as cytokinesis, phagocytosis and in wound repair. The interaction between membrane tension, unfolding and trafficking has been demonstrated by a number of studies. In fibroblasts, the cell spreads and increases surface area initially by lamellipodia extension and unfolding of the membrane reservoir stored in folded microvilli and blebs. After these membrane stores are depleted, an increase in membrane tension activates the second stage of spreading, where a fresh supply of membrane is brought to the leading edge by exocytosis. These exocytic vesicles predominantly contain glycosylphosphatidylinositol-anchored (GPI) proteins, and are trafficked to the membrane in a microtubule independent manner. During this slower process of spreading, exocytosis increases the plasma membrane area by around 50%. , , , . This sequential process of membrane unfolding followed by exocytosis also occurs to facilitate macrophage cell shape changes during phagocytosis . Recently, membrane tension has also been implicated in regulating the type of vesicle fusion during exocytosis. Inhibition of the small Rho family GTPase Cdc42 led to impaired exocytosis as vesicles were unable to enlarge the fusion pore created at the beginning of membrane fusion. This resulted in vesicle exocytosis by kiss-and-run fusion rather than full-collapse. Measurement of membrane tension using optical tweezers revealed that Cdc42 knockdown reduced membrane tension, which was responsible for the shift in the mode of exocytosis .